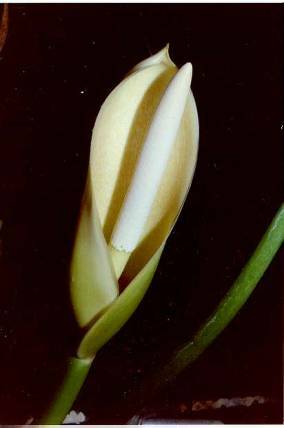 The spadix of Philodendron is monoecious with naked unisexual flowers. Flowers lack a perigon and are closely arranged on a more or less cylindroid spadix with the staminate flowers comprising the upper 2/3 to 4/5 of the spadix and the pistillate flowers comprising the remaining basal portion. The average spadix for P. subg. Philodendron in Central America has the staminate portion 2.2 times longer than the pistillate portion with the longest staminate portion averaging 10.8 cm long and the longest pistillate portion averaging 4.9 cm long. The spadix is usually contained for the most part inside the spathe at anthesis (see section above on SPATHE) although in the majority of species, the spathe is weakly exserted in front of the spathe. 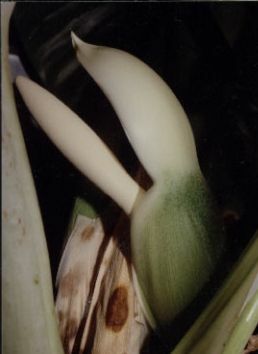 Even in this slightly forward position the majority of plants at anthesis have their spathes erect or tipped slightly forward so that the spathe actually can provide shelter from water dripping straight overhead, which is far more common in the habitats where Philodendron occurs than blowing rain. 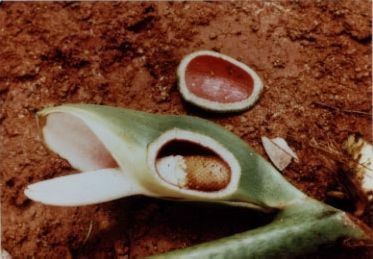 Some species, especially those with broadly opened spathes, e.g., P. angustilobum (Fig. 51), P. ligulatum (Fig. 266), P. mexicanum, and P. tripartitum have spadices which protrude prominently forward at anthesis. 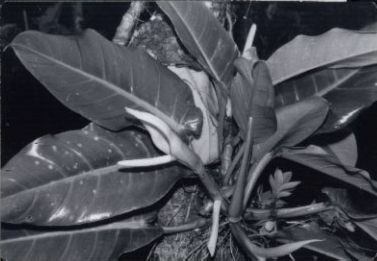 Other species whose spathe remains convolute to about the middle, such as P. heleniae (Fig. 229), may also have spadices which protrude prominently forward. Other species with prominently convolute spathes and with somewhat less protruding spadices are P. auriculatum, P. davidsonii, P. grayumii, P. hebetatum, P. jodavisianum, P. ligulatum, P. llanoense (Fig. 268), and P. panamense (Fig. 299). The spadix of Philodendron is usually only slightly shorter than the spathe. The average length of the longest spathe for is 16.5 cm while the average length for the longest spadix is 15.8. Thus on average, the spathe is nearly 1 cm longer than the spadix. These differences may be as little as a few millimeters or or as much as 4 cm. The spadix of Philodendron, though highly variable in detail, is in general, the same for all species in Central America. 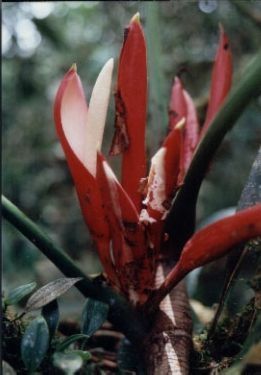 The lowermost portion is pistillate, usually pale green to greenish white and obliquely attached to the spathe, and sometimes markedly stipitate at the base. The floriferous part of the spadix is thus longer on the adaxial surface (front) than on the abaxial (back) surface. The differences in the length of the adaxial and abaxial surfaces of the pistillate spadix depend on the angle at which it is attached to the spathe. These are referred to as "front side" and "back side" of the spadix in the descriptions presented in this revision. The staminate portion of the spadix makes up the balance of the spadix and characteristically has a swollen sterile section at the base. Typically the staminate portion is broadest at the sterile section and gradually constricted just above the sterile section. Above the constriction the spadix is fertile and is gradually broadened usually to a point about 2/3 of its length, then narrowed gradually or abruptly to the tip. The staminate portion is usually uniformly white to creamy white on the outside, although sometimes with the axis pinkish. Immature spadices are usually green though they become white well in advance of anthesis. The sterile section of the staminate portion is commonly of a different color than the fertile section. Often it is more nearly white at an earlier stage of development when the fertile flowers are typically green. At anthesis the fertile staminate portion is more likely to be tinged with yellow or tan, reflecting the higher concentration of oil in these flowers than in the fertile flowers (see below). However, sometimes, at anthesis the sterile staminate flowers and the fertile staminate flowers may be identical in color. The sterile staminate portion frequently can be distinguished easily after anthesis as well with the sterile portion maintaining a white color (Fig. 28) while the fertile portion may turn grayish or brownish. The sterile staminate portion can usually be distinguished even is these cases by the difference in the size of the spadix, usually larger than the adjacent fertile staminate portion, by the usually larger and more irregularly shaped flowers and because the sterile staminate section typically ends just before the narrowly constricted portion of the fertile staminate portion (which itself coincides with the constricted portion of the spathe). The sterile staminate flowers are often more easily discernible on dried specimens than they are on live specimens since they tend to dry a different color, usually somewhat more brownish. Another distinction between the fertile and sterile staminate flowers, this one reported by Mayo (1986), is that the staminodia have a more distinctive floral receptacle and often have a multiple-branched vascular trace, versus having an indistinct floral envelope and only a once-branched vascular trace for the fertile staminate flowers. The much higher oil content in the sterile staminate flowers was reported by Pohl (1932) and it is probably owing to this that the sterile staminate flowers are often eaten by the beetle pollinators (Fig. 29). A high concentrations of lipids in the mitochondria of the staminodia has been documented (Walker et al., 1983). The fertile staminate portion of the spadix is typically more or less clavate but also bluntly tapered toward the apex. In a few species, such as P. advena, P. crassispathum, and P. davidsonii, it is more nearly oblong-ellipsoid, often broadest at the base and bluntly tapered toward the apex. The spadix of P. ferrugineum is similarly shaped but it is somewhat more constricted above the sterile staminate portion. Some species, e.g., P. heleniae, have the spadix broadest in the upper one-third rather than in the sterile staminate portion.